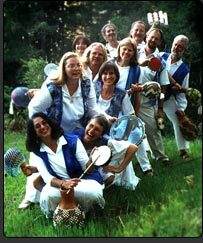 Batucada Nana de Santa Cruz is a Samba group based in Santa Cruz California, modeled after a Brazilian Batucada. Escolas de samba (samba schools) in Brazil often have thousands of members, 10% to 20% of whom are percussionists. One of the smallest groups which can faithfully represent Samba is a Batucada, which normally has from about 8 to 25 percussionists. "Nana," is the name given to the African American orixa who is associated with the purest waters, springing from deep within the earth. In her essense, she's a wise grandmother figure who embodies the qualities of love and respect for all people and cultures. Batucada Nana plays material from a broad repertoire of Brazilian and Cuban rhythms: Samba from the urban areas of southern Brazil, Marakatu and Samba Reggae from northeastern Brazil, Samba Terreiro from the religious houses of Brazil, three-drum orchestrations of the music of Santeria from Cuba, Comparsa Carnaval music from Cuba, and various West African bell ensembles. Many songs are accompanied by traditional lyrics in Portuguese, Spanish and West African dialect, sung by the percussionists as they performa feat that is rare even in indigenous settings.